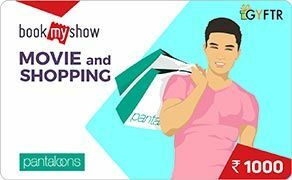 Pantaloons E-Gift voucher can be redeemed for any product at pantaloons stores across India. Pantaloons E-Gift voucher is valid for minimum 6 months from the date of issue. Validity period of the E Gift voucher will not be extended under any circumstances. Pantaloons E-Gift voucher is redeemable only once and only by the bearer. Pantaloons E-Gift voucher is not valid at shop-in-shops & on jewelry. Pantaloons E-Gift voucher has to be redeemed in full and partial redemption is not allowed. Pantaloons E-Gift Voucher is not redeemable for cash or credit nor can be exchanged for a gift voucher/gift card. No duplicate will be issued if Pantaloons E Gift voucher is lost or misplaced. Providing the correct Mobile no & E-mail Id will be customer's responsibility for trigger of E-GV Redemption Code. Protect the E-Gift card number and PIN to avoid misuse. Pantaloons shall not assume any liability in case the e-GC PIN gets stolen/compromised, Pantaloons shall neither replace the e-GC nor refund cash. Please contact Shop Manager for any acceptance issue and if issue is still not resolved, you can write in to [email protected] or Call 08510004444 (10 am to 10 pm) for Immediate help. Any dispute should be referred to any company and decision of the company shall be final. Pantaloons E- voucher has been issued subject to the terms of the company. Litigation, if any, is subject to Jurisdiction of courts in Mumbai. For list of Stores, click here http://pantaloons.com/store/store-locator.